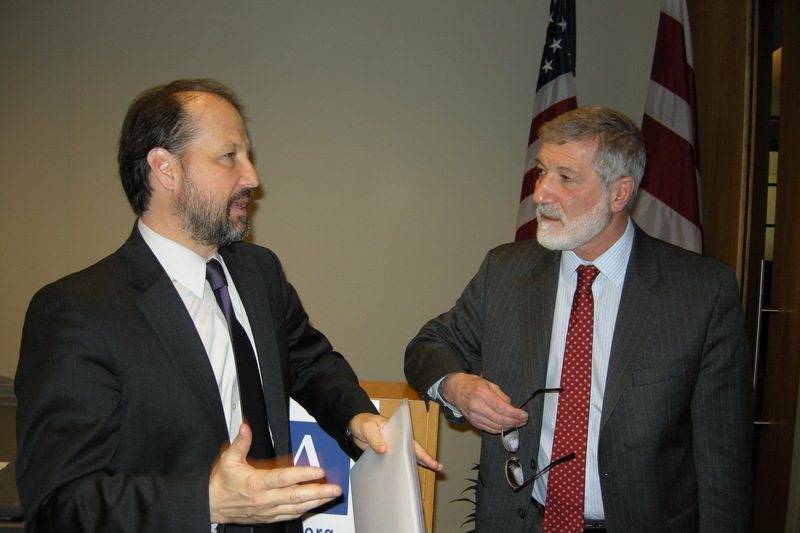 Ira Helfand (right) and Arms Control Association executive director Daryl Kimball, who moderated the panel discussion. Back in the 1980s there was a very, very widespread understanding of what was going to happen if there were a nuclear war. We’ve lost that understanding, by and large. Certainly, in the general population, there is very little understanding about what nuclear weapons can do or even how many there are in the world. What is really quite new, I think, is the discovery in the last eight years, starting in 2006, that even a very limited use of nuclear weapons would cause a global catastrophe. In a war in which cities were targeted with nuclear weapons, perhaps as many as 20 million people would be killed in the first week directly from the explosions, from the firestorm, from the direct radiation. In all of World War II, about 50 million people died over eight years. This is 20 million people dying in the course of a single week. Moreover, this limited use of nuclear weapons—far less than half of a percent of the world’s nuclear arsenals—causes profound global climate disruption. Temperatures worldwide drop about 1.3 degrees centigrade and this effect lasts for about a decade. As a result of that, there would also be a very significant disruption of global precipitation patterns. And as a result of these combined effects, there would be a very profound impact on food production. We issued a report in April of 2012 suggesting that up to a billion people worldwide could die of famine. Since then, new data shows that there will be widespread hunger in China as well – another 1.3 billion people at risk. We have never had an event like this in human history where anywhere from 15 to 30 percent of the human population dies over the course of a decade. And this is a real possibility in the event of a war between India and Pakistan, which is itself a real possibility. The effects of a large-scale war dwarf even these horrors. If only 300 warheads in the Russian arsenal detonated over targets in American urban areas, between 75 and a hundred million people would be dead in the first 30 minutes, and a U.S. counterattack on Russia would cause the same kind of destruction. In addition to killing this many people in half an hour, this attack would also completely destroy the economic infrastructure of this country. But again, as mind-boggling as this kind of direct toll is, it is not the worst part of the story because a war between the United States and Russia also causes profound climate disruption. A hundred small warheads in South Asia put 5 million tons of debris into the upper atmosphere and dropped global temperatures 1.3 degrees centigrade. A war between the United States and Russia, using only those weapons that are still allowed when New START is fully implemented in 2017 – that war puts 150 million tons of debris into the atmosphere, and it drops global temperatures 8 degrees centigrade on average. In the interior regions of Eurasia and North America, the temperature decline is 25 to 30 degrees centigrade. We have not seen temperatures on this planet that cold in 18,000 years, since the coldest moment of the last ice age. In the temperate zones of the Northern Hemisphere, there would be three years without a single day free of frost. Temperature goes below freezing at some point every single day for three years. And that means there is no agriculture, there is no food production. Most of the ecosystems in this zone collapse. The vast majority of the human race starves to death, and it is possible that we become extinct as a species. Now, if that is the starting point of the conversation, the next thing that flows from that is these weapons cannot exist. We know that there is a real and finite possibility every day that they will be used. And if that is true, then it is simply a matter of time until they actually are used, and that means they cannot be allowed to exist. And that is a very different starting point than where we are in the current conversation about disarmament. And that’s why this argument, I think, has become so powerful. The plans of the nuclear weapon states to maintain their nuclear arsenals indefinitely are simply unacceptable, and we need a fundamentally different new approach. They say that politics is the art of the possible. Statesmanship, I think, is clearly the art of the necessary. And it is time that we ask our leaders to act like statesmen, not like politicians. It’s time that we demand that behavior of them. And I think that’s what this whole movement is about at this point. It is calling the nuclear weapons states, saying that we will not accept their behavior anymore, and demanding that they change. So the question becomes, how do we move the process forward? Well, people could just abandon the NPT, or they could try to engage in some kind of productive international diplomatic initiative to achieve the stated goals of the NPT, which is the elimination of nuclear weapons. And I think the people who have been advocating for a convention to ban nuclear weapons understand this is not the end stage; this is a way of trying to move the ball down the field, of trying to put some pressure on those nuclear weapon states that are using the NPT process, frankly, to preserve their nuclear monopoly. And there’s just no patience left in this idea of acceptable nuclear apartheid. The nuclear-weapon states can’t have it both ways. They can’t say “it’s OK for us to have nuclear weapons because we’re never going to use them” on the one hand, and on the other hand say “our policy is based on deterrence. For deterrence to work, we have to convince people that we will use them.” You just can’t do this. It’s one or the other. You can’t say we’re never going to use nuclear weapons and then talk about the circumstances in which we can use them legitimately and safely and without it being a humanitarian disaster. Either you’re going to say that you’re never going to use them, or you’re going to say that you are going to use them. And if you’re going to say that you are going to use them, then if it’s OK for the U.S. to use them and to have them so we can use them, then how can you tell the rest of the world that they can’t? And the fact of the matter is, we have lost that argument. The rest of the world rejects that—and rightly so—because the argument is profoundly flawed. The nuclear ban treaty that’s been proposed is a political tool to try to create pressure to get to a nuclear weapons convention. What has been proposed is a treaty that bans not just use, but also possession, to make the point that these weapons should not be maintained, even when countries say they’re never going to use them, because of the very clear fact that the countries that say they’re never going to use them in fact do have plans for using them. If this administration in the United States, which is so allergic to the idea of a ban treaty, put forward any significant initiative at this point, I think we would all rally behind it. A ban treaty really does move things forward in a very dramatic way and I would encourage people to support that, but I think if other ideas come forward, you know, it’s fine – whatever moves the ball forward. We’ve just got to get some movement in the right direction and we’re not getting it right now. The humanitarian message, I think, is the key. The thing that motivated Gorbachev, according to his memoirs, to take the initiatives which he took in the 1980s were the conversations he had with physicians from my organization, in which they explained to him what was going to happen if the weapons were used. And remarkably, as the head of a nuclear power, he didn’t fully understand what was going to happen if a nuclear war took place. The same is true of most of the leaders of the nuclear weapons states today.